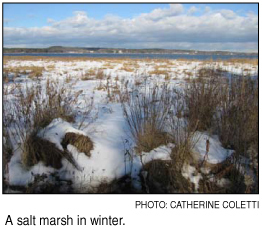 The sun glares off the snow, which blankets most of the ground on the salt marsh. I can see my breath in the air. We squint in search of the Canada geese and ducks that come to spend the winter here. Species such as American black ducks, mallards and American widgeon will forage for seeds, stems, leaves and even snails and small clams on the exposed mud flats of the low salt marsh when the tide is out. Today we spot the silhouettes of crows, adept scavengers in many surroundings, including this one. My tour guide is Steve Miller from the Great Bay Discovery Center in Greenland, New Hampshire. He said, Theres still some deep holes, so watch your step. I forgot to wear gloves, left my hat in the car and can feel my ears turning red with cold, but I dont mind because I feel like Ive stepped into a scenic painting. On the horizon, the water looks blue in the sunshine, but when a cloud passes overhead, it becomes a muted gray. Above our heads, the dead stems of common reed (Phragmites australis)this particular bunch is a native stand (we can tell because it has lost its leaves)line the outer edge of the marsh and rustle dryly in the wind, inviting us to enter. Once we pass the taller growth, the marsh reminds me of a sort of winter Wild West, wide open and the wind now whipping around my hair. The leaves and stems of the smooth cordgrass (Spartina alterniflora) and salt hay (Spartina patens) are half buried in the snow in ankle-high clusters. Steve and I weave around their dead brown tops. During winter, most of the perennial plantsthe plants that will come back each springuse energy and nutrients absorbed by their rhizomes, or underground plant stems, to stay alive under the ice. The cordgrass has an additional winter survival strategy: tiny purple-tinged shoots at the base of last years dead growth connect the roots and rhizomes to the oxygen in the air above. In the spring, the purple shoots do not grow bigger, their job having been completed. Steve and I come across a pool covered with a thin sheet of ice. Most likely there are mummichog fish, crabs and shrimp buried in the mud at the bottom of the pool, where they will stay until the suns warmth and light sends them the memo to come out. Snow acts as an insulator, keeping the creatures underneath protected. Burrowed in their winter homes, they are oblivious to the influx of the tides, which bring seawater in and out twice a day. The velocity and depth of the tides fluctuate with the position of the moon in an ancient dance. 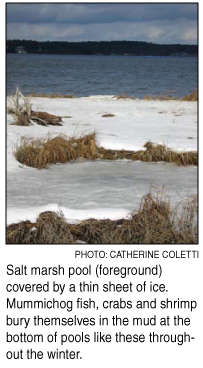 During low tides, thin layers of ice form across the marsh and freeze to the plants and peat, or soil filled with organic matter. If freezing temperatures remain in an area sheltered from wave action, the ice deepens, reaching thicknesses of 1 to 2 feet (30-60 centimeters). In an amazing process called ice rafting, the ice chunks get sucked away by the outgoing tide, taking hunks of peat and plants with them. The plants hitchhike to new locales, sometimes deposited in marsh areas to take up residence, and sometimes doomed to sub-tidal habitats where they cant survive. Steve said he has seen ice chunks the size of bathtubs with plants sticking out of them floating out of Little Harbor, when he worked at the Seacoast Science Center along the Atlantic shoreline in New Hampshire. Ice rafting also happens in rocky areas, where it rips away the fucoid, or brown algae that grows there, including knobbed wrack (Ascophyllum nodosumm), which is commonly recognizable as seaweed. However, if deposited in a marsh, the fucoid algae ultimately form free-living plants that appear quite different than their original sources. Plants or animals produced in response to habitat factors such as ice rafting are called ecads. Typically the fucoid ecads grow entangled within the cordgrass and form extensive biomass, particularly during the spring, prior to the extensive growth of the cordgrass. Both the cordgrass and the fucoid algae are important sources of detritus, or dead plant and animal matter, within salt marshes, providing energy to the marsh system. Avoiding all of that above-ground winter upheaval, the horseshoe crabwhose name is a bit of a misnomer as it is not a crab species but is related to spiders and scorpionsmoves to deeper and warmer waters and waits for spring burrowed in the mud, sometimes with only its tail sticking out. Many resident New Hampshire horseshoe crabs overwinter in Great Bay and Little Bay, and will migrate to the shallower waters near the marsh when the water hits about 10 degrees Celsius (50 degrees Fahrenheit). This spring, increasing light and warmth will tell the marsh to wake up, melting the snow and splattering green across it like a modernist painter. The melting away may reveal a weathered face, as ice, tides and waves have chipped away at its fragile outer edges. Due to the cold ocean water brought in by the tides, salt marsh plants grow a bit later than inland ones, and most make their spring debut around mid May. Also around that time, the horseshoe crabs will be spawning at the high tide line, their eggs providing food for many bird species, some of which rely on the additional energy to migrate. This spring, the animals and plants and land and water will continue their inter-relationships into summer, fall, and then return to another winter, where dark and cold will tell them to die back, slow down and once again wait to emerge into life. Catherine Coletti is assistant editor of the Gulf of Maine Times.